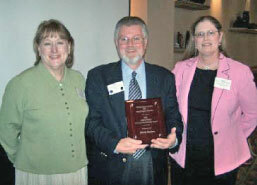 Randy Boston (center) was presented the 2006 Donna Rossa Award by Denise Donnelly, president of TAHQ (left) and Donna Rossa (right). Randy stated he was especially honored to receive the award from Donna for whom the award is named. Each year, at the annual meeting of the Texas Association for Healthcare Quality, a member is honored for outstanding leadership and achievement in the field of healthcare quality management and service to the professional association. TAHQ annually nominates the recipient of the Donna Rossa TAHQ Distinguished Service Award for consideration for the National Association for Healthcare Quality’s Claire Glover Award. Nominations may be submitted by individuals or by TAHQ local area associations. Individual nominees are notified of their nomination and are requested to provide data for consideration in the selection process. All nominations are reviewed by the TAHQ Awards Team and the recipient of the Donna Rossa TAHQ Distinguished Service Award is selected by that team. Service to TAHQ at the state or local level. Outstanding achievement in professional practice in the field of healthcare quality. Leadership in quality management education. Leadership in quality management networking and advancement of the profession. Designation as a Certified Professional in Healthcare Quality. Contributions to the practice of quality management through research. Publication in the field of healthcare quality. For a nomination form, visit the TAHQ website and login to the members’ only area to download the form.